Many parents who are thinking about enrolling their kids into swimming lessons at our Aurora IL swim club have questions. They want to know more about our programs, our staff, and our state-of-the-art swim facility. They’re interested in learning how our instructors address various issues, such as when a child cries during a lesson. Many parents also want to know how involved they’ll be in the process. Below, you’ll find answers to common questions the staff at our Aurora IL swim club are asked by parents who want their children to learn how to swim. Children progress at their own pace, and numerous factors play important roles. For example, a student who was acclimated to the water as a toddler will feel more comfortable than one who’s experiencing it for the first time. Also, a child who has had a bad experience in the water may require more time and encouragement to gain a reasonable level of comfort. The regularity with which children attend lessons also has an impact. Weekly swim lessons are likely to lead to faster progress than instruction given over a random, haphazard schedule. Our Aurora IL swim club offers a range of programs. Some are designed for adults. Others are designed for young people. Still others are tailored for parents and their toddlers. These latter programs are perfect for children as young as 6 months of age. Some children need a little extra time and encouragement to feel comfortable in the water. It’s completely natural for them to cry. This is especially true if their parents are in view. At our Aurora IL swim facility, we’ve found that the most effective response involves three steps. First, parents are asked to leave the immediate vicinity so they’re out of sight. Second, our instructors, all of whom have experience teaching children how to swim, will help nervous and rattled students gain a level of comfort in the water. Third, we encourage parents to compliment their kids after the lesson for a job well done. These three steps help students gain the confidence they need to focus on the instruction. We’ve found that most children thrive in group swim lessons. They’re able to watch other kids master the basics, and gain the confidence to do the same. They also enjoy a fun learning environment that combines exercises with games. Having said that, some children perform best when they’re enrolled in private swim lessons. They have the full attention of the instructor and benefit from instruction tailored to meet the student’s needs. 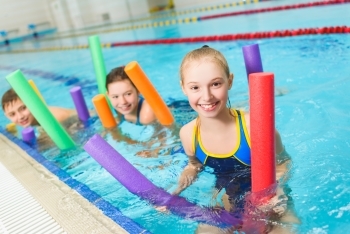 If you’re not certain which type of lessons are best suited to your child, stop by our Aurora IL swim club and speak with one of our experienced instructors. You’ll need to bring two things: your child’s swimsuit and a towel. Note that our facility offers showers. If you’d like your child to make use of them, consider bringing hair shampoo, hair conditioner, soap, and other such items. Many parents bring swim goggles for their children to wear during the swim instruction. The decision to do so for your child is entirely up to you. We’ve found that children are more receptive to putting their heads underwater when their eyes are protected and they enjoy clear visibility. If you have questions regarding our swim facility, swim programs, or any other facet of our swim club, visit our FAQs page. Or visit our facility for a firsthand look at why more parents choose the DuPage Swimming Center for their children. The experienced staff at the DuPage Swimming Center has taught thousands of children and adults how to swim and be safe in the water. From independent submersion to advanced stroke mechanics, the lessons are designed to cater to every level of expertise. Contact us today to find out how our instructors can teach your children to become proficient swimmers.